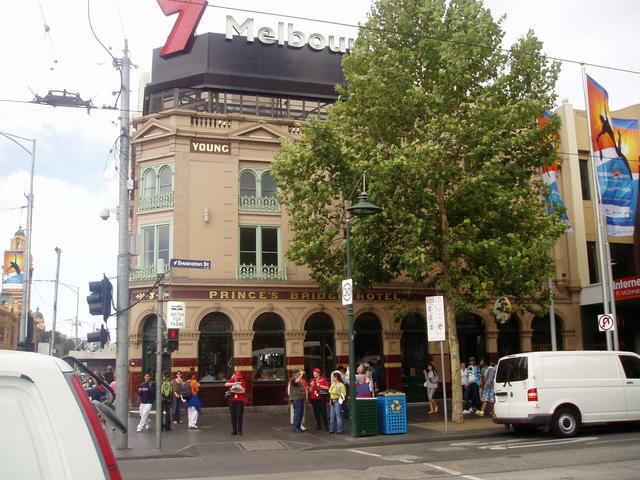 A one day Pub-Trail visit to Melbourne to get acquainted with all the attractions, and some fine old taverns. 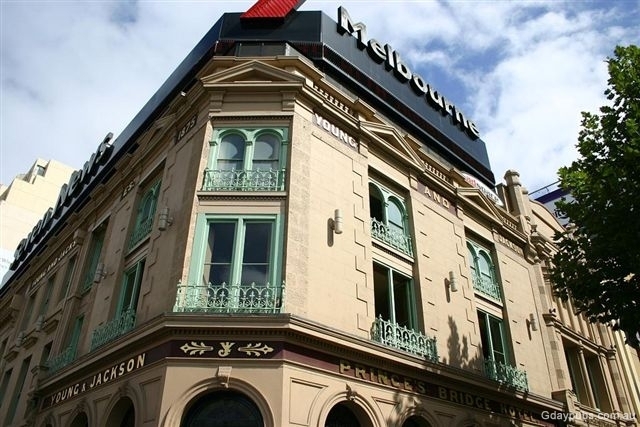 If you only had a day to visit the centre of Melbourne, what would you have to see, as a Pub Trail lover of historical Taverns? Mind you, we'd recommend spreading this out if you have more than a day! Flinders St, travelling down into the heart of the city. Inspecting Federation Square and Southbank in the centre. finding a safe route home! If you travel by car, try parking in East Melbourne near the Fitzroy Gardens (TIP: not related to the city of Fitzroy) at the eastern end of Flinders St. Try Lansdowne St, Clarendon St or Wellington Pde in East Melbourne. Arrive early, to get an all-day parking meter without paying the cost of inner city car park fees if you like – that leaves more change for some fine ales! 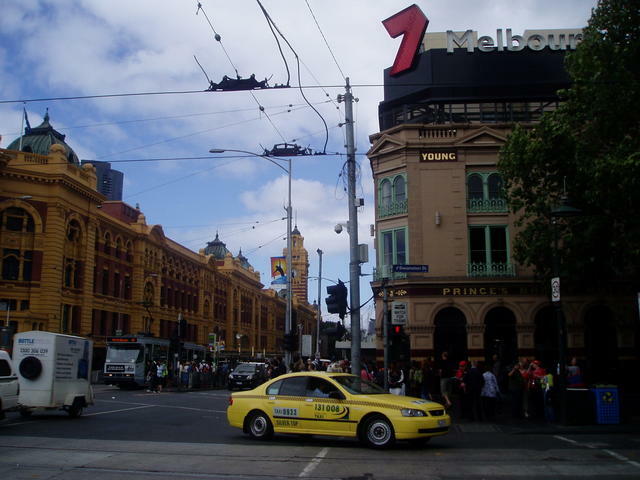 An ideal starting point for a walk through Melbourne, is to start at the corner of Spring and Flinders St, (and finish there later) which happens to be the South East corner of the major blocks of Melbourne (the grid). The free Brown Trams, which run every 10 minutes, around the perimeter of this grid, permit you to see then entire city in about 40 minutes, and you can hop on/off anytime. This is a great way to get your bearings on where everything is. we drive on the left side of the road - most of the time. Melbourne has trams, and at some intersections in the heart of the town, the trams have control of the intersections, and cars making a right-hand-turn, have to sit on the left hand side of the intersection until the lights change, and do what is called a 'hook-turn' into the road on the right just as the cross-path traffic are given the green light.... It's a bit tricky, so have a local explain it! Melbourne has freeways that don't link up in the middle very well, and hence the name 'free'way. It means you use up a lot of your free time, enjoying the freeway rather than pub trailing. The demographic centre of Melbourne is actually about 10kms east of Melbourne, in Glen Iris. So be aware of this when planning any travel thru this busy part of Victoria. 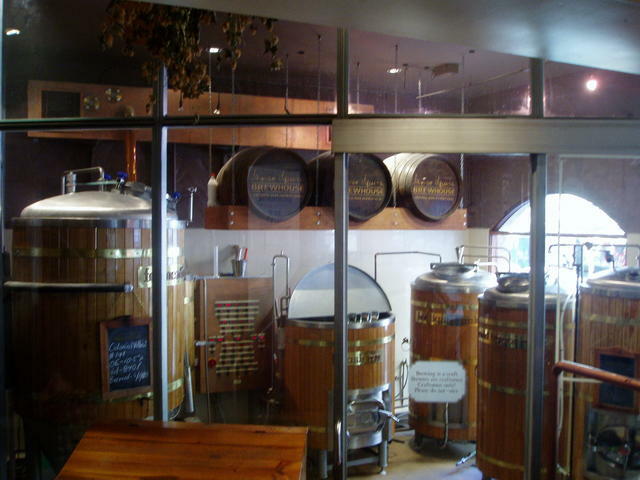 Anyway - on with the historic trail... try to focus on the ales and the scenery, and forget the traffic. Happy Pub trailing in Melbourne! From this first corner, head west down Flinders St which eventually leads you to the infamous FLINDERS ST railway Station which is on the corner of Swanston St (which runs down the middle of the town North to South). Victorians, like a lot of Australians, are very keen on sports, so lets get the footy and tennis arrangements immediately sorted out. 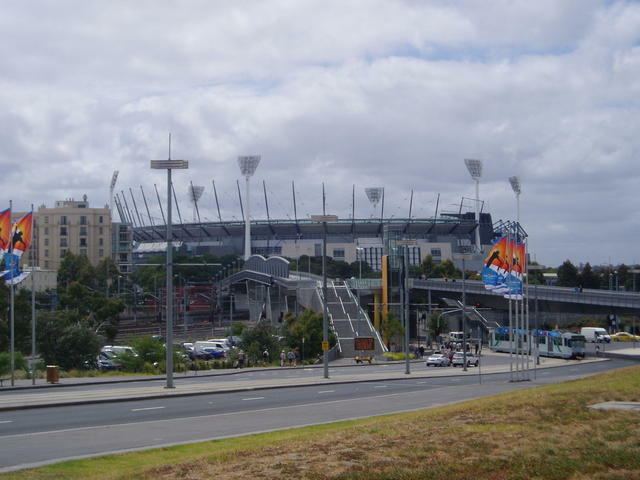 On the way, you will observe on your left, over the railway yards and towards the Yarra River winding in from the South East, the MCG (Melbourne Cricket Ground – also the venue for the Aussie Rules Grand Final football matches). Next to that, still on your left in the distance, you’ll see the Melbourne Tennis Centre (Rod Laver Arena and Vodafone Arena), (formerly aka Flinders Park, then the National Tennis Centre, now Melbourne Park) with the Alexandra Gardens and Government House white tower/flag poking inconspicuously opposite in the far distance. Your Flinders St walk, will firstly cross Exhibition St intersection, that is now the start of the Southern exit to the freeways to the south-eastern suburbs (to your left) heading down past the tennis centre. On this corner, you’ll see the original Sun-Herald Newspaper building on your right, and the Forum Theatre on the adjacent side. Further down Flinders St, you will come to the corner of Russell St, and you would be gaining your first view of Federation Square just ahead of you. BUT, instead, walk left (south) down Exhibition St a little (known as Exhibition St extension when it was extended over the original railway stock yards), and cross over the parkland to reach the Giant Ferris Wheel that is adjacent the Yarra River, and into Birrarung Marr (formerly Batman Avenue). Melbourne is a town of changes - so really check the names of places when you try to find them! 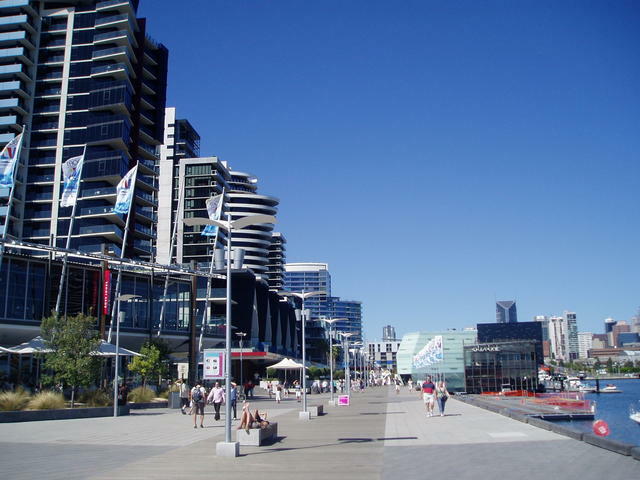 This is a walkway that has a man-made beach area and entertainment area, leading up to the Federation Wharf, a small landing where you could consider a Yarra Boat cruise, The cruises could take you upstream (east towards the tennis centre) or west, downstream, under the Princes St Bridge (which is St Kilda Rd –the extension of Swanston St) past the Southbank wining/dining area on the south side of the river. 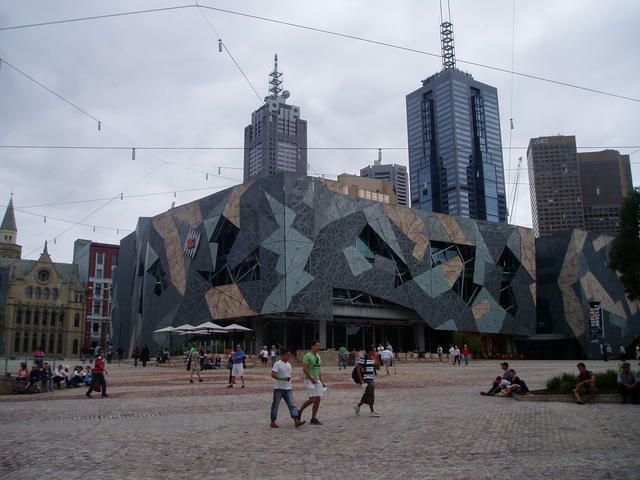 Or keep walking west along the river, as you now pass the back of Federation Square. Take a few steps up into the side of Federation Square on your right, just before reaching the Swanston St end of the Birrarung Marr beach/river walk, and wander thru the Federation Square attractions – Art, Big Screen showing sport/events, or take in a coffee. Be sure to check out downstairs areas too! 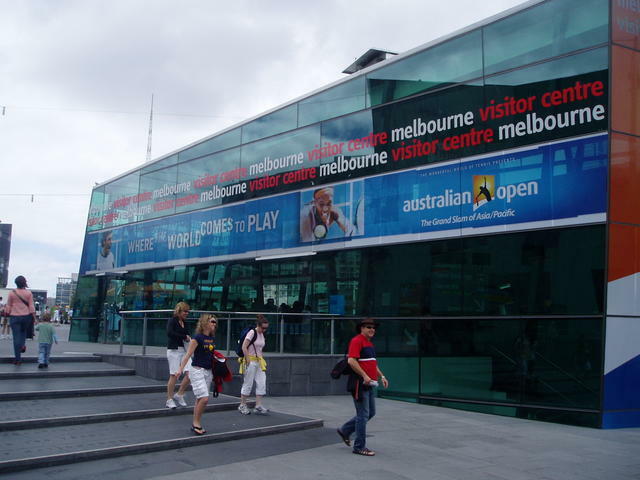 Probably the best Tourist Information Centre in Victoria, is located here, right on the corner of Flinders St/Swanston St, underground on the corner edge of the Federation Square pavement, adjacent to the big screen. Pop down and ask any of the friendly staff, what is happening, and what’s to see. They have a wealth of information, tour guides, maps and itineraries. We recommend them highly! 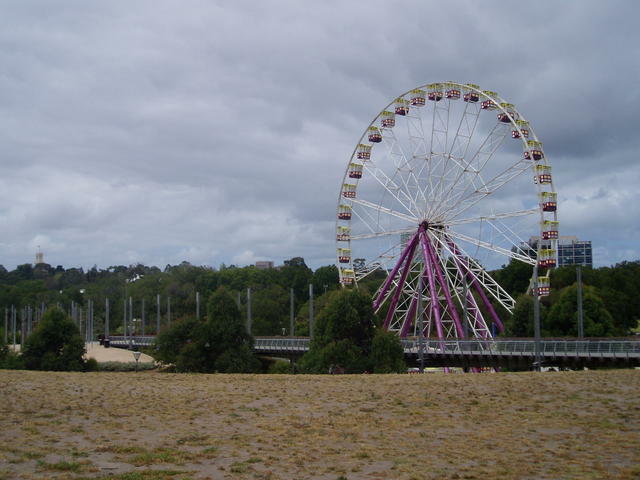 View (looking south from Flinders St) of the Ferris Wheel on the beach (Yarra River) at the walk through Birrarung Marr - alongside the southern exit of Exhibition St extension. In the distance on the left, you can see the flag flying over Government House, the home for the Victorian Governor. A fine view looking west towards the centre of the city, from where Exhibition St extension meets the river edge along the Birrarung Marr walk. Well you’re in the middle of Melbourne now – the corner of Flinders St and Swanston St. Well it’s actually the southern end of the original 6 square blocks that formed Melbourne from its inception in 1837 which was laid out as a grid. Flinders St runs along the southern end of that original grid, and Swanston St bisects it at the mid point where you are now. On this corner, is Young and Jackson’s, which houses the infamous painting Chloe on the 1st floor. Pop over and have a look, and maybe take in an ale, as you look out the windows to the Flinders St Station and Federation Square that is on the opposing corner, and St Paul’s Cathedral on the adjacent corner. 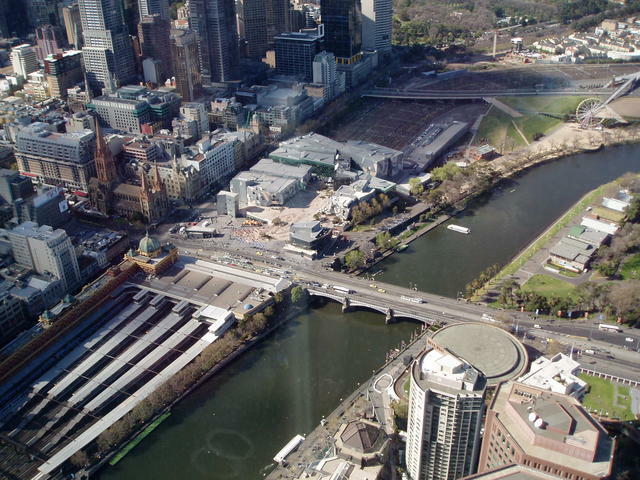 Over recent years, the southern side of the Yarra River has been extensively developed, with the Arts Centre, Southbank (shopping/eateries), Casino and now the Eureka Tower - tallest building of 89 floors with an observation deck which is a brilliant view for an hour before/after sunset. With this development, the overall size of the Melbourne has effectively widened, and hence the Federation Square is now in the middle of the entire City. 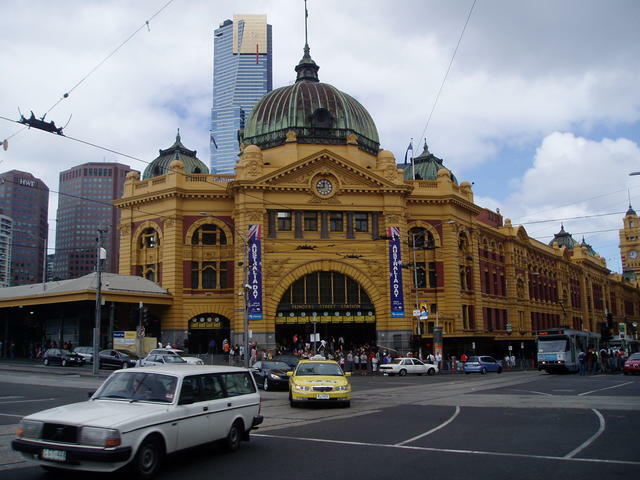 Wander over the road to stand under the Flinders St Railway clocks, and take some happy snaps of this landmark. 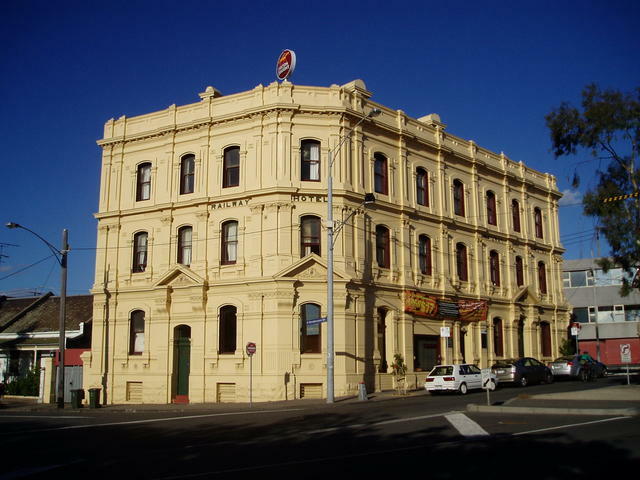 Young and Jackson's Hotel- a Melbourne icon! and Finders St Railway Station Clocks. 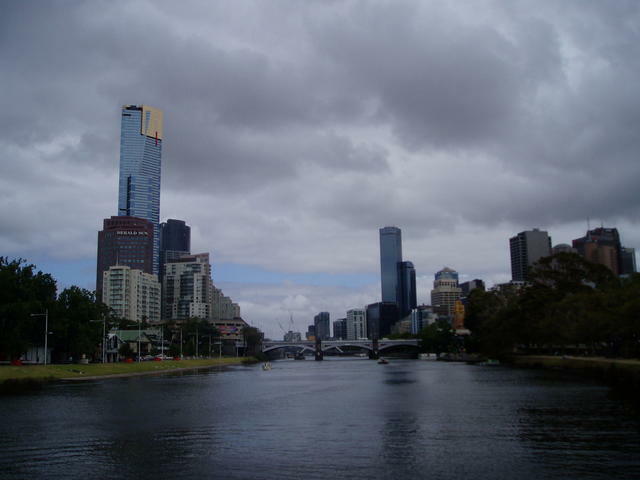 Start walking south, down Swanston St, over the Prince's St Bridge, crossing the river, and stop to look up/down the river views. 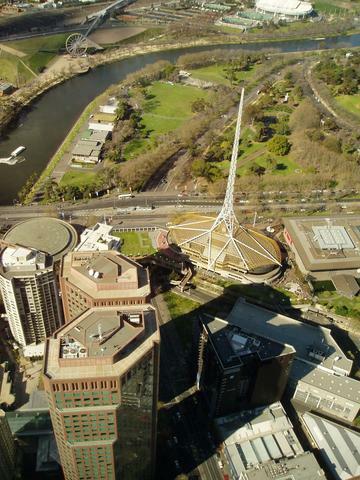 South, you’ll see the spire of the Melbourne Arts Centre complex comprising the Hamer Hall, State Theatre and Arts Centre. Take a look around these fine buildings, which have the beautiful Alexandra gardens opposite you to the East. Crossing the river on Swanston St, the road becomes known as St Kilda Rd, and trams can take you down this great Boulevard to St Kilda Beach and back – but that’s another day. (Luna Park, StKilda Esplanade market, and the foreshore of the bay is great to see down there). When you crossed the Prince's Bridge, the end of the bridge (on your right) has a set of steps that lead you down to the edge of the Yarra, and you can take them to walk down through Southbank shopping and restaurant area, and perhaps consider a bite of early lunch here. 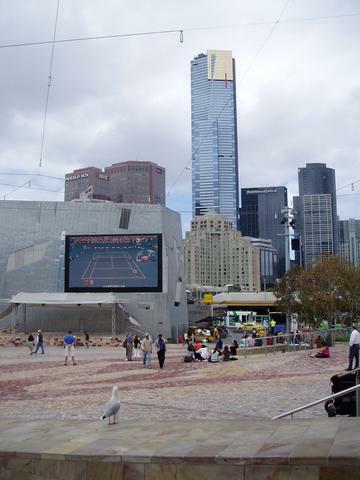 One block south of SouthBank Promenade, towering over the entire precinct, you find Eureka Tower. It is located in Riverside Quay. 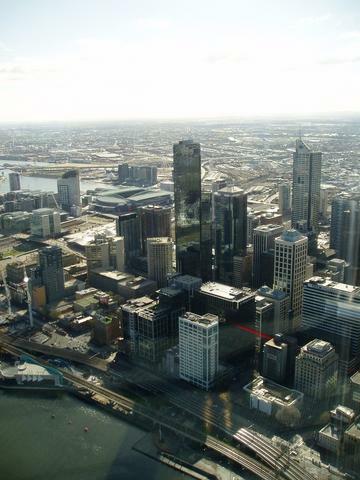 A number of the aerial views of Melbourne on this webpage, are snapped from the 89th floor observation deck. On a clear day, you can see for over 50kms in all directions from this tower. As you walk down the southern side of the river, you’re seeing the entire length of the rear side of the Flinders St Railway Station complex, which has a second clock tower about 2/3rd of the way down (western end). At that point there is an arched walkway bridge over the river, that takes you under that clock tower (under the railway in fact) and leads you back onto Flinders St again. Under the (single) clock tower, you are on the corner of Flinders St and Elizabeth St. (perhaps it is time for that Brown tram ride if you’re tired, because it will take you right around the outer grid and bring you back to this point if you like). Time to savour the best meeting areas of Melbourne! Cross over to the north side of the street at the clock tower corner, and walk slightly back towards Young and Jackson’s, east along Flinders St for about 100 yards until you come to a small alleyway called DeGreaves St, and walk up through the laneway, and check out all the quaint eateries, wine bars and coffee shops of this popular area. 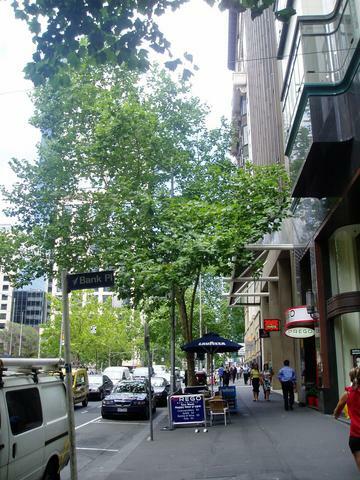 At the end, you’ll cross Flinders Lane (a half street), keep going north and you’ll come out at Collins St – Melbourne’s most admired leafy street! Over the road you’ll find the BLOCK COURT and BLOCK ARCADE that runs from Collins St, around a left hand bend, and back into Elizabeth St. 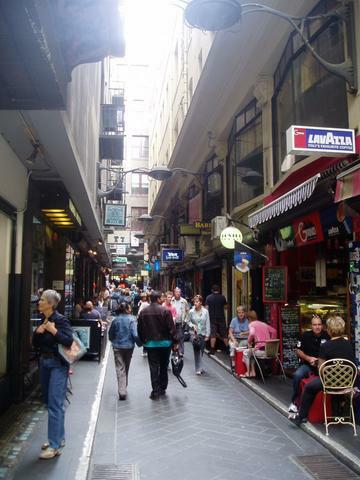 This arcade boasts some of Melbourne’s oldest architecture and shops. Enter the BLOCK from Collins St, and it will take you up and left exiting into Elizabeth St. Head south towards the Elizabeth St Railway clock tower a few shops distance, to come to the corner of Collins and Elizabeth St. Corner of Elizbeth St and Collins St.
Another view of DeGreaves St eateries. 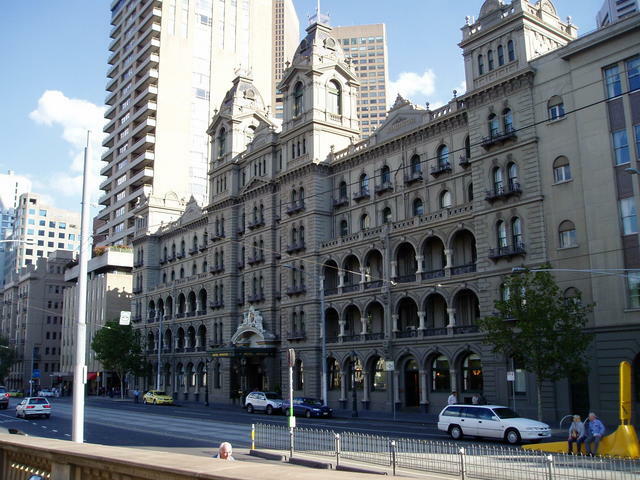 Collins St to Queen St to the oldest building in Melbourne: Mitre Tavern! From here, walk west along Collins St, admiring all the old buildings – many of them banks and financial/insurance institutions, but the architecture is great!. As you walk up Collins St, you’ll cross Queen St, and pretty soon, you’ll come across a small laneway on your right called: BANK PLACE. Watch for it, it’s small. So too is the laneway, but as you go up Bank Place, you’ll come across Melbourne’s oldest building, which is the Mitre Tavern. 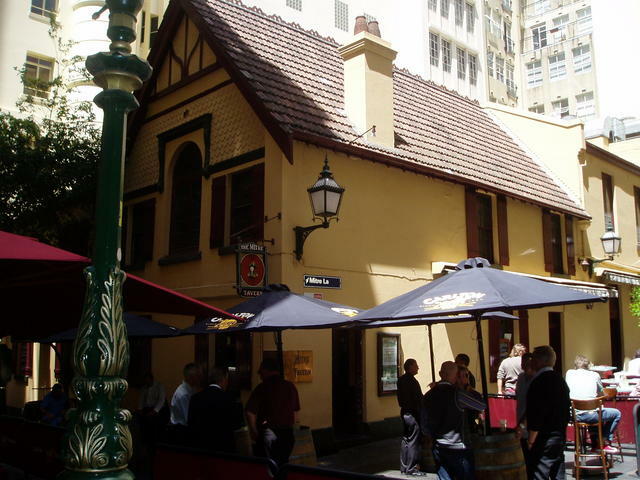 Built in 1836, it has one of the best Tavern atmospheres for enjoying an ale, you can find, in Melbourne! Sit a spell and enjoy the ambience of the Tavern, or sit outside and meet/talk with the locals. It’s a top spot on a warm afternoon in Melbourne. Maybe this is lunch? 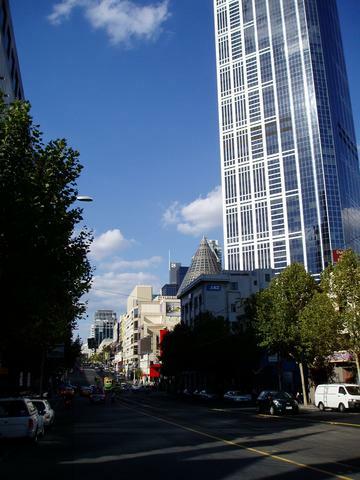 Back to Collins St again, and start walking further west, and you’ll come to William St, and then King St. On your left, you come to the RIALTO Building (tall dual building complex of blueish glass) which has an observation deck on the 55th floor, 823 feet tall. Take a left, south down Kings St from the corner of Collins St, and you pass many of the night club areas of this end of town, and as you reach the river again, you arrive at the Melbourne Aquarium, which could be another half-day visit. You’ve just gone over Flinders St (again) as you then cross the River and you come to the Casino on Southbank again. 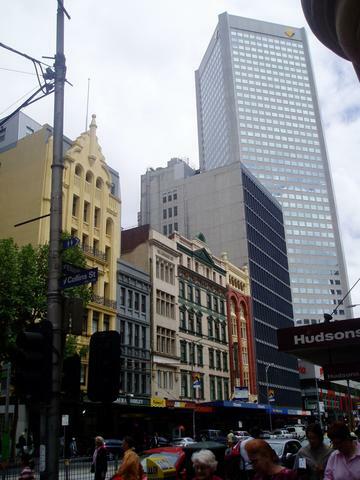 This runs two city blocks from the Crown Towers Hotel on your left (oval shaped cylinder building of greenish glass), extending right through under the King St overpass you're standing on, and through to Spencer St (which becomes Clarendon St) on your right. Further to your right, (one block down, on Claredon St) as you cross the river, is the new Melbourne Exhibition Centre complex which hosts events like the International Car Show and the like. 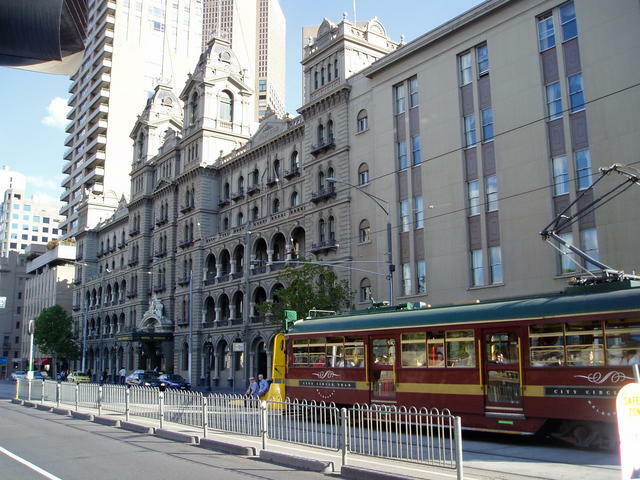 At this point, look through the Casino (Hotel lobby staircase and chandalier especially), and come back over the river again to Flinders St where it is definitely time to catch that brown tram! If you haven’t done the 40 minute tram loop, do it now, but keep track of the four sides of the grid you go around. You can go in either direction. Catch a tram heading west (away from where you’ve been at Federation Square and the railway). 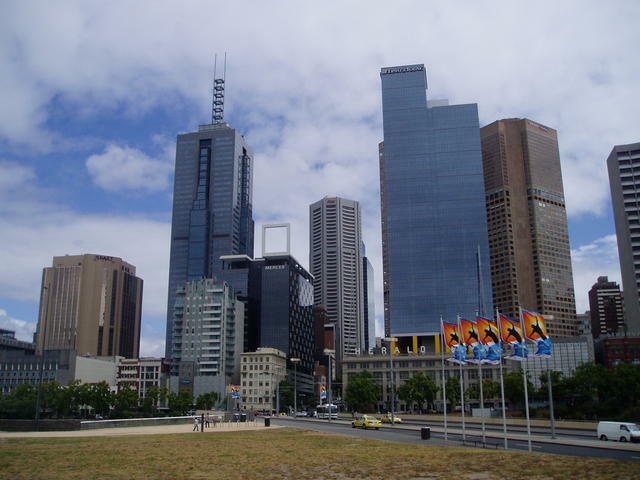 The route will take you down the end of Flinders St, through the docklands district which is worth a visit. 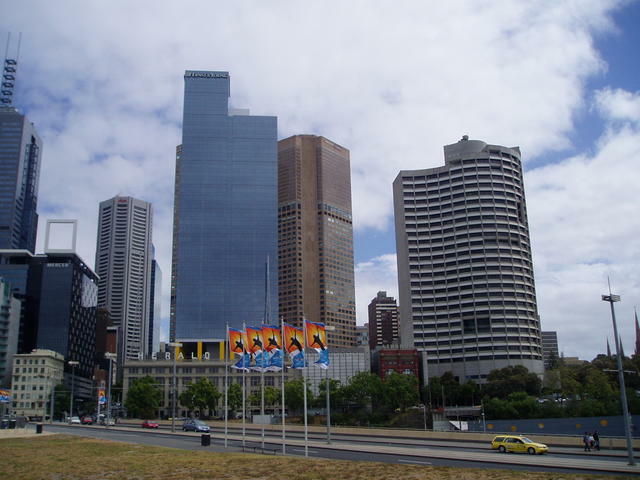 You’ll go past Telstra dome where various sports events are held, and take you to the new skyline apartments area that is now populating the harbourside of Melbourne. 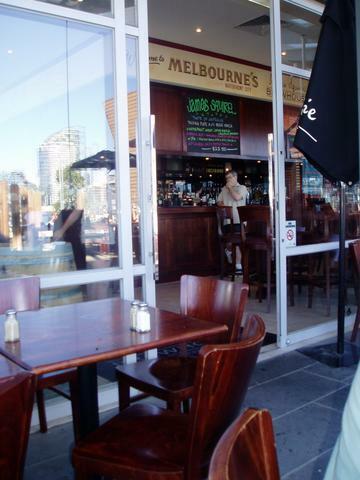 Stop off a moment, and walk the length of the docklands many restaurants, and drop by the James Squire Docklands tavern at the end! Time to travel along the northern end of the city grid, via Latrobe St.
Jump back onto the Brown Tourist Tram to head up LaTrobe St, from the end of the Docklands. Continuing along, the tram takes you along the northern end of Melbourne eventually leading you to Spring St at the eastern end. LaTrobe St takes you past the Flagstaff Gardens, and crosses the top end of all those streets you’ve been seeing earlier. (in the order:Spencer St, King St, William St, Queen St, Elizabeth St, Swantson St, Russell St, Exhibition St. and the end: Spring St). As you pass over Queen St or Elizabeth St, as you are trundling down LaTrobe St, you can stop and wander further up Queen St to the Queen Victoria Market (closed Monday’s Wednesday’s and most public holidays – and best visited earlier in the day – again: A plan for another day). James Squire Docklands - a pub at the very end of the Docklands walkway. 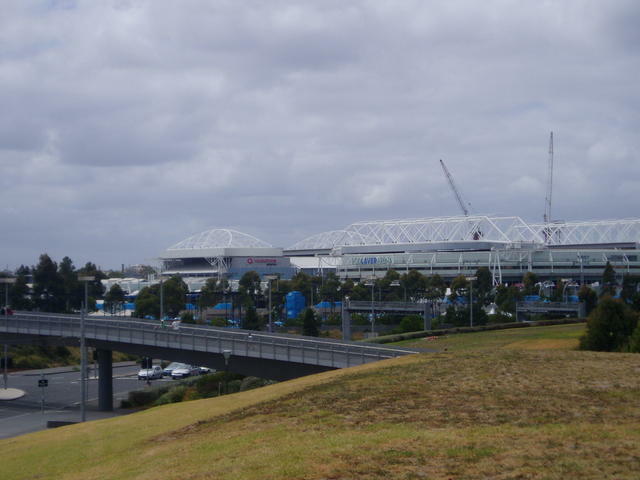 View from the end of the docklands precinct(west from Latrobe St exit) looking back towards the city with Telstra Dome stadium in the foreground. Latrobe St over Queen St up to Spring St. Theatres, Parliament and high class drinking! Back on the tram, and further along Latrobe St, (crossing Elizabeth St) you’ll start going up hill slightly, up towards the corner of Swanston St. You'll be passing Daimaru Tower with the infamous shot tower inside the shopping complex (on your right), and RMIT (Melbourne’s oldest College of technology – now a University) taking up most of the left side of the road, and the Planetarium and State Library on your right - all on the corner of Swanston St. So, there's lots to explore at this intersection! Pop into the State library, and check out the DOME ROOM – a beautifully architected reading room. Then back on the tram (east along LaTrobe St again) to the end where it takes a right turn into Spring St.
Spring St is the Government end of town. But it also has Princess Theatre (near corner of Bourke St) and one block down from there, is Her Majesty’s (Lt Bourke and Exhibition St), both fine old theatre establishments. On the left side of Spring St as you cross Bourke St, you come across Melbourne’s Parliament House built in 1855, and seat of Parliament until federal Parliament moved to Canberra in 1927. A well worthwhile historical visit. And, of course, right opposite, is Windsor Hotel, built in 1883, with its infamous Cricketer’s Bar at 111 Spring St.
Time for a wander on foot again. Go west down Bourke St from Spring St, and down to Exhibition St.
By the way, if you want to take in a movie, most of the picture theatres are one block in front of you further down Bourke St, which becomes a MALL (but watch the trams that still go through there!). The MALL goes between Swanston St and Elizabeth St, and in the middle of the mall is the huge department store of Myers. Good place to go if you want pretty much anything shopping wise, and you can go through a maze of interconnecting malls, walkways, arcades, that link up Bourke St all the way back down to Flinders St where we described the DeGreaves St mall earlier. But again – that’s a shopping day!. So…..
Where were we? Ah yes, on the corner of Bourke St and Exhibition St, contemplating going down into the cinema/shopping district another day. 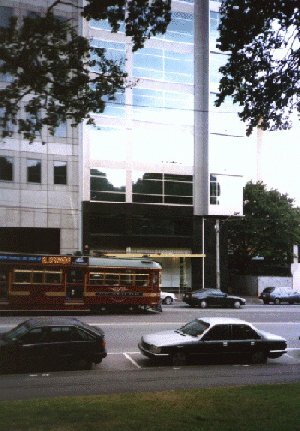 501 Latrobe St (near King St) right opposite Flagstaff Gardens. Flagstaff Gardens are at the western end of Latrobe St, and a nice place to walk across to the Queen Victoria Market when open. Watch out for possums in the trees if walking through here at night! But stop, you need to do a couple of things at this point. First, you need a beer. So turn left and go half a block to Little Collins St, and left again into 62 Lt Collins St, to Bridie O’Reillys – Melbourne’s original Irish PUB. ou have one more decision – stay and enjoy the great pub atmosphere, and fine food – or go Chinese. One block back along your tracks up Exhibition St again, to Little Bourke St, is the heart of the Melbourne China Town, and by now it is surely late and you are hungry. 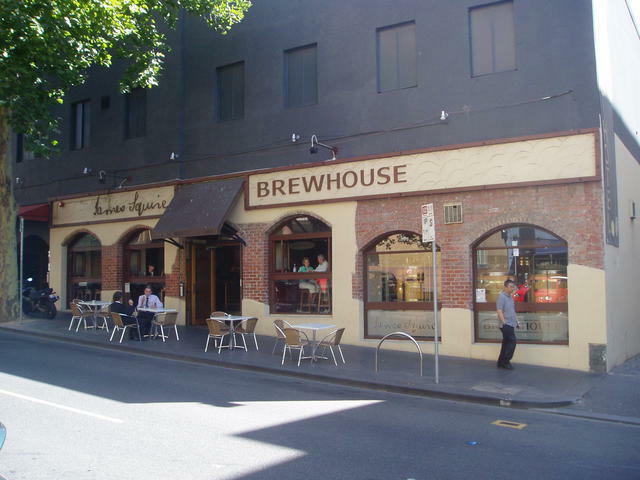 Of course, there is that other "James Squire Brewhouse" - Portland Hotel just down the road on the corner of Lt Collins and Russell St! Public Transport or back to Fitzroy Gardens...Time to sleep! Well you’re at the end of this exhaustive Pub trailing initiation to Melbourne, and you’re now pretty close to where you started, not far from the corner of Spring St and Flinders St. The top end of town at Bridie O’Reilly’s or China Town, is also not far from Parliament Station if you came by public transport, and you can go underground on the corner of Spring and Bourke St – or that brown tram again to carry you closer to Flinders St to find that car is, that you left in the Fitzroy Gardens. As you see, the little Brown Tram provides some great opportunities to see the entire grid of Melbourne - and you can freely hop on oand off at various points. I hope I've managed to give you a glimpse of the sporting venues, historical points, where the nightlife is, attractions, exhibitions and skyline highlights, and of course a few of great pubs! There's obviously far too much to do in just one day, but I hope this itinerary will provide the basis for many more, leisurely trips for you to enjoy another day in our fine city of Melbourne! Bridie O'Reilly's - a fine place for a Guiness! 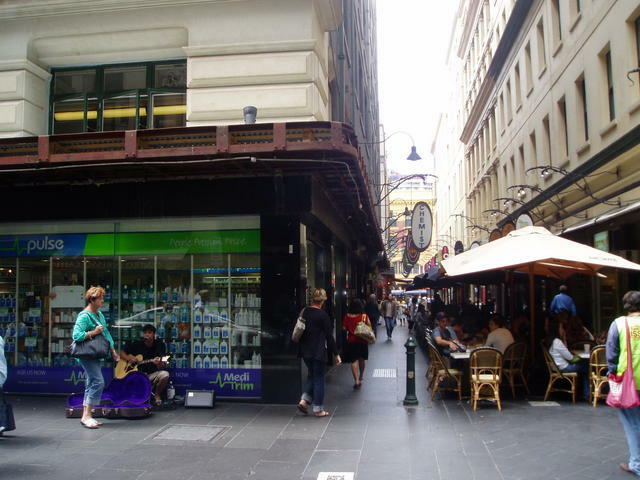 West Melbourne along Victoria St and into Errol St is a mecca places to eat meet and be merry. Amongst the many locations of interest, is one place that Gaz does a lot of preparation for GdayPUBS and just happens to be the favourite watering hole of the technical chaps that meet for their MLUG meetings on the 4th Friday of the month! 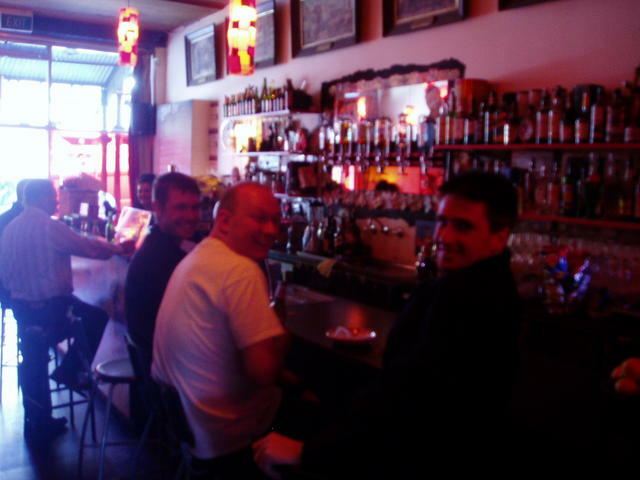 Railway Hotel - possibly one of the LONGEST bars in Melbourne! As you walk up Collins St, you’ll cross Queen St, and pretty soon, you’ll come across a small laneway on your right called: BANK PLACE. 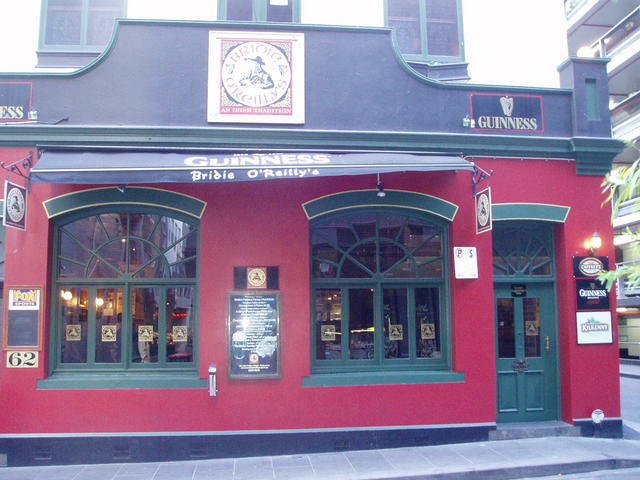 Finding yourself on the corner of Bourke St and Exhibition Streets, turn left and go half a block to Little Collins St, and left again into 62 Lt Collins St, to Bridie O’Reillys – Melbourne’s original Irish PUB. You have one more decision – stay and enjoy the great pub atmosphere, and fine food – or go Chinese. One block back along your tracks up Exhibition St again, to Little Bourke St, is the heart of the Melbourne China Town, and by now it is surely late and you are hungry. 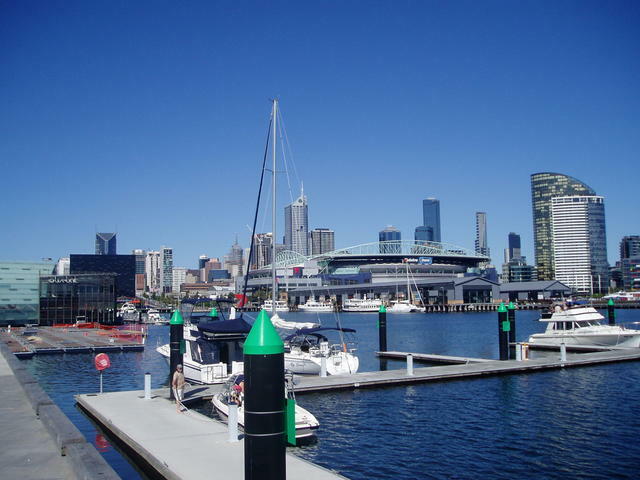 View of the Docklands waterside walk, looking back east towards the city of Melbourne.